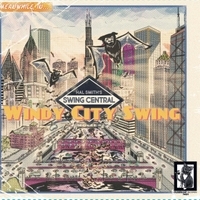 Swinging Chicago Style Jazz, with a mix of standards and original compositions. 4. For No Reason at All In "C"
"Hal Smith's Swing Central is not only a wonderous cohesive group, inspired by the music of Pee Wee Russell, Lester Young, Frank Chace and friends, but it affirms joyous principals. "This quietly thrilling band reminds me not only of the three inspiring clarinet playing individualists, but of the possibilities of music that gently breaks down the barriers some listeners and journalists build, cubicles labeled 'schools' and 'styles'. Swing Central takes familiar songs and makes them fresh and dewy; Jon's compositions and reinventions are witty beyond their titles. And these players -- happy rovers in the land of medium tempo, great ensemble players as well as inspiring soloists -- go for themselves rather than copying. "Sir John Davies, a Renaissance poet wrote 'Orchestra', his conception of a cosmos vibrating in symphonic harmony. If we are very fortunate, the world might vibrate as does Hal Smith's Swing Central -- tender, relaxed, urgent..."